NEW VIDEO!! made in partnership with Lentils! 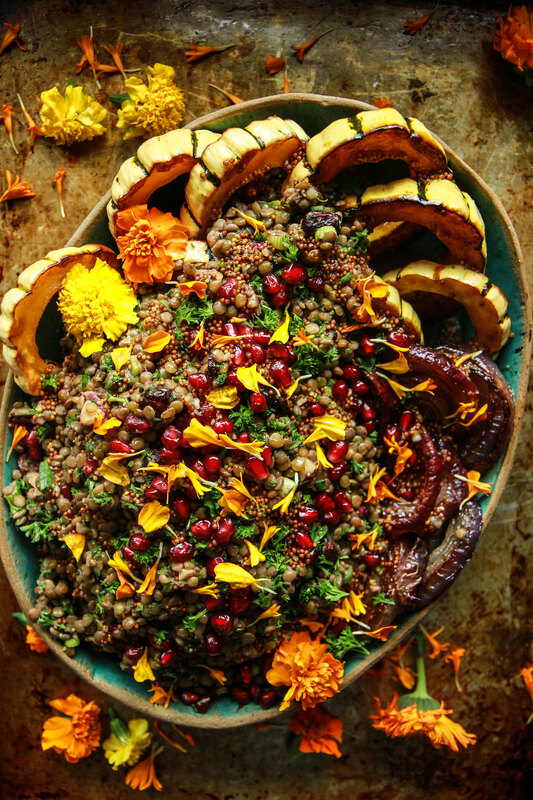 You are going to love this cozy, delicious Warm Lentil Salad! I hope that you are still having a wonderful long weekend and getting to soak up lots of good time with your family! But we have to have balance in life, right!? 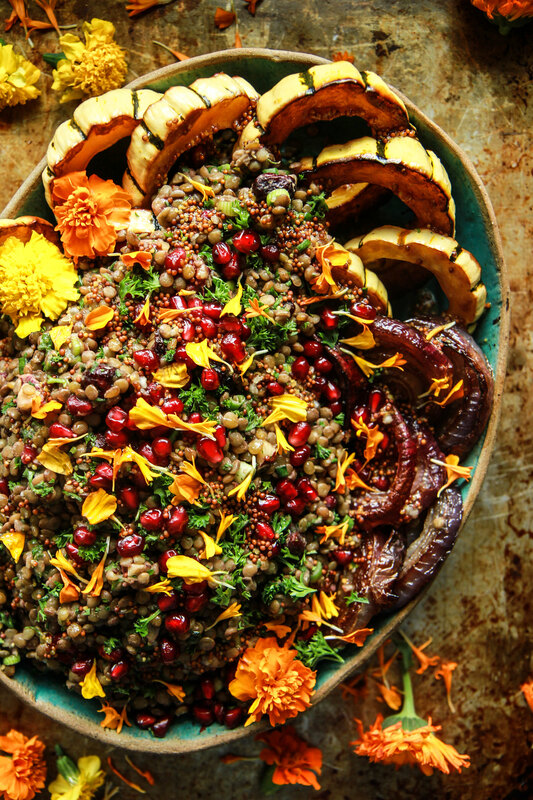 So I made this delicious Warm Lentil salad to be healthy and keep us full and warm today! I love any reason to make a salad, and one that happens to be vegan and full of plant based protein is all the better for us! This one is packed with delicious lentils, green onions, fresh herbs, toasted walnuts and dried cranberries and that before we even add the roasted delicata squash and roasted red onions and drizzle everything with a mustard maple vinaigrette that is out of this world! It is the easiest dish to throw together, taking under 30 minutes and its so delicious! Have fun and stay warm today! Preheat the oven to 425 degrees. Place the squash and red onions on a sheet pan, drizzle with olive oil and sprinkle with kosher salt. In a saucepan, combine the water, lentils, garlic, bay leaf and salt and bring the lentils to a boil. Then turn the heat down to low, put a lid on the pot and simmer the lentils for 15-20 minutes until they are firm but tender. Drain off any extra liquids and add them to a large bowl. While the lentils are simmering, put the vegetables in the oven to roast for 15 minutes until golden brown. Make the Vinaigrette by whisking the garlic, mustard, syrup, vinegar and olive oil. Season to taste with kosher salt. Add the green onions, parsley, cranberries, toasted walnuts and half of the pomegranate seeds. Add half of the vinaigrette and gently fold together. I promise it will be super easy Kelly! Would this pair well with salmon? Cooked with lemon or honey soy? What is the best protein to pair this up with? I think this would be excellent with salmon- grilled or pan-fried! A roast chicken would also be a great compliment! Does it need salt? It was a bit bland. Also, can I do it a day before and then serve it cold? This was delicious! couldn’t find delicata so subbed in acorn squash- the dressing is wonderful and the whole dish was a great veg friendly (and diabetic friendly) treat. thanks for this, looking forward to more of your recipes! for the future- any suggestions about advance prep and freezability? thanks much! This is SO delicious! Made it for Thanksgiving last Fall and made another version of it this weekend. Filling, totally customizable to veggies at hand, and the dressing!!! Pure tangy deliciousness, that dressing. From the bottom of this diabetic vegetarian’s heart, thank you for this recipe! !